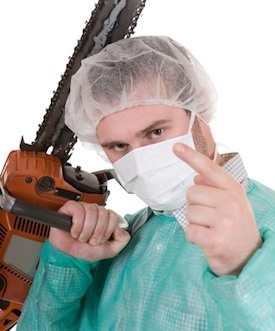 If I were to say that chainsaws were originally made to deliver babies, what would you say? You would probably think I’m off my face on some hallucinogenic party drug or something. How could a device that’s widely used in the timber industry, and I can’t forget B grade horror movies, ever be associated with the birth of a child? 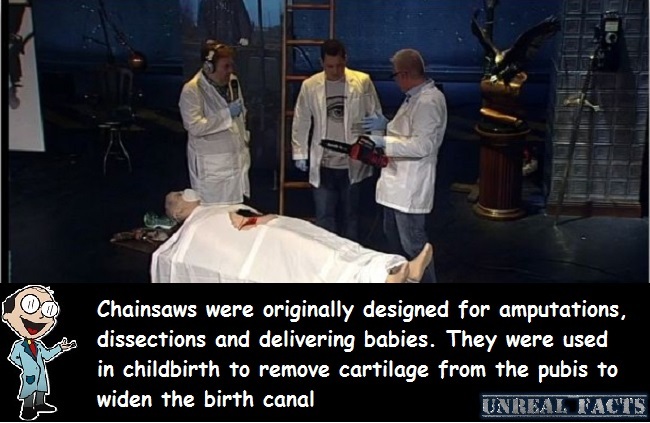 Well chainsaws were made to deliver babies, along with dreaded, but necessary amputations. Furthermore, they’re a lot older than you might think. Way back around 1783-1785, a couple of Scottish doctors were working on a new device to make the procedure of dissecting limbs, amputations and symphysiotomy easier and quicker. You probably already know what we mean when we talk about amputations and dissecting limbs. But what is a symphysiotomy? Well, a symphysiotomy is a surgical procedure that removes cartilage from the pubis to widen the birth canal. Yeah, it’s probably as painful as it sounds. To carry out this operation, along with the dissections and amputations with crude hand operated tools would have made the entire process messy and agonizingly painful. The new device was designed to speed the entire process up, and the device to dissect and deliver babies was the chainsaw. Doctors John Aitken and James Jeffray designed the first chainsaw for delivering babies and dissecting limbs over two hundred years ago. While their invention certainly did speed up the process, it must be remembered that there were no anesthetics available for the patients at the time the saw was first being used. A faster operation would have shortened the ordeal, but the pain would have still been intense, to say the least. This chainsaw continued to be used in operating theaters for most of the 19th century. It was eventually replaced with the Gigli twisted wire saw. Today the chainsaw is a must have tool for all arborists and wanna be mass murderers.